... standard and her layout appealed to him. She is a simple boat but has all the requirements of a great sports fisher or family cruiser. The large cockpit is conducive for fishing, diving and outdoor living. 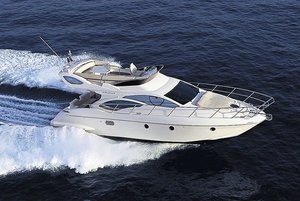 Flybridge express-cruisers are closed-deck crafts. NauticExpo classifies crafts as such when they measure between 9.5 m (31 feet) et 15 m (50 feet) so as to differentiate them from other similar categories. Flybridge express-cruisers feature a rooftop piloting station. Flybridge express-cruisers offer optimum visibility via the rooftop piloting station, which makes them ideal for fishing. The flybridge can be a small cockpit installed atop the craft's roof or a covered, wider unit forming part of an equipped balcony. A supplementary steering station can be situated inside, which allows to keep away from harsh conditions and enjoy the sun.